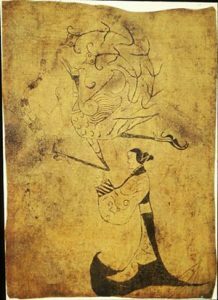 In 771 BC, skillful fighters from the northwest invaded Zhou Dynasty China; they may have been the ancestors of the Huns. These Central Asians had figured out how to ride horses in war, and wanted to use their new cavalry to conquer northern China. The Zhou system of fighting from chariots wasn’t up to fighting these new horse-riding armies. So the Zhou emperors retreated towards the Pacific Ocean and made a new capital at Luoyang, further east. So we call this period the Eastern Zhou. Historians call the first three hundred years of the Eastern Zhou period the Spring and Autumn period because it was a good time for China. Many philosophers, like Confucius and Lao-Tzu, were working in China at this time. Farmers invented the mold-board for their plows. Tool-makers in China learned how to use iron to make tools at this time; they probably learned from iron-workers in West Asia, maybe by way of India or Central Asia. Chinese traders started to travel to Korea. But iron also made good weapons, and the 200 little states began to fight each other all the time. Historians call the period from 481 to 221 BC the Warring States period. 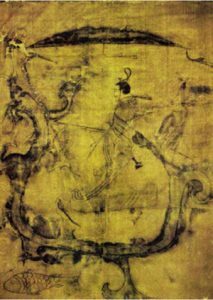 By this time, Chinese armies had learned from the Central Asians how to ride horses into battle. But they had trouble breeding good horses in China, where the climate wasn’t right for it. Chinese armies bought most of their horses from Sogdian traders. Chinese spinners and weavers – mainly women – started to produce a lot more silk cloth in order to trade it to the Sogdians for the horses, and for high-quality iron. So Silk Road trade became much more important to China during the Warring States period. Trade went eastward too, as ships started to sail between China, Korea, and Japan. By about 300 BC, there were only seven big states left. Soon after that, in 256 BC, the Zhou emperors lost power, and the only rulers of China were the kings of the seven states. These kings fought among themselves until the king of Qin, the strongest state, succeeded in making himself emperor and established the Qin Dynasty. Cite this page: Carr, K.E. Eastern Zhou Dynasty – Ancient Chinese History. Quatr.us Study Guides, June 6, 2017. Web. April 24, 2019.